Candles have always been famous for their ability to brighten up gloomy and dull areas. They exist in a wide range of designs, colors, patterns and sizes. Pillar candles are the most popular type of candle and trending the most as well. These pillar candles can be used for lighting purpose as well as for decorative purposes. Too large and tall candles create an absurd look, but these medium sized pillar candles are perfectly crafted in every way to provide a balanced effect to the place where in it is placed. This pillar candle is a beautifully crafted Indian essence yellow colored piece. The candle is 6cm x10.5cm in dimensions with height of about 9.7cm, width 6.2cm and depth 6.2cm. The candle wax has been mixed with a sweet fragrant oil and then crafted into a beautiful table top accent piece. The candles provide a traditional as well as western look to any occasion or event as thus is so commonly in use. The vivacious yellow colored pillar candle easily complements any decor or event color scheme and also adds a feeling of warmth and subtleness through its glow. The classic and rich scented pillar candle collection crafted with love by skilled artists adds a statement of classy look to any occasion. Pillar Candles are used for lighting purpose and decorative purposes at homes, office and shops center table tops. They can also be used for theme decoration at events, parties, birthdays or weddings. Scented pillar candles are also cute gifting solution to loved ones such as family and friends. 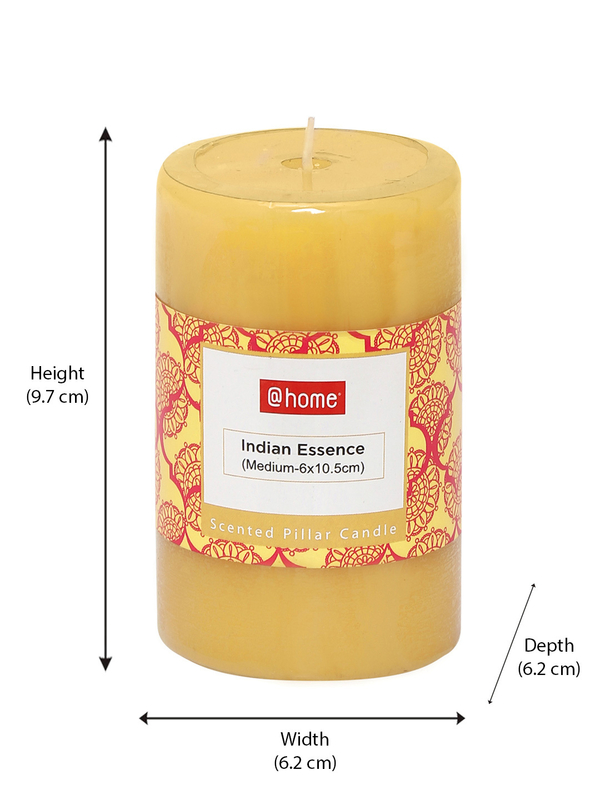 These pretty Indian essence medium sized rustic pillar candles can be bought from @Home now.